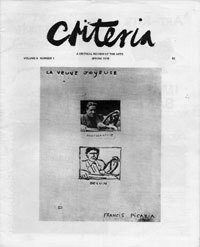 Ardele Lister founded and edited the journal CRITERIA, a Quarterly Review of the Arts, in 1975 in Vancouver. It was initiallly published under the auspices of the Vancouver Art Gallery, but by 1977 had dis-affiliated. Volumes 1-4 were published until Fall 1978, Volume 4, Number 2. 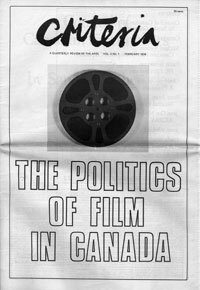 Archived issues are below to view or download. 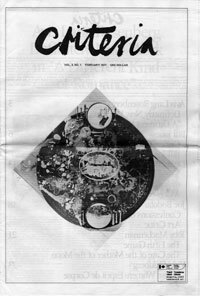 Ardele Lister founded The Independent, the first magazine devoted to the needs of independent video and film makers, published by the Foundation for Independent Video and Film, in New York in 1978. She edited the first several issues. The Independent is still published by the Foundation for Independent Video and Film, and available online here. Read an Interview with Photographer, Dennis Wheeler, and Filmmaker, Robert Frank, in Criteria Vol 3. No 2. 1977.